Keith Earls put in a man of the match display against Romania, but should not have been put back on after sustaining a head injury, says George Hook. Two tries and a man of the match performance will surely be enough to put Keith Earls firmly in the frame for Schmidt's first 15, but should he have been allowed to continue after being taken off for a head injury? 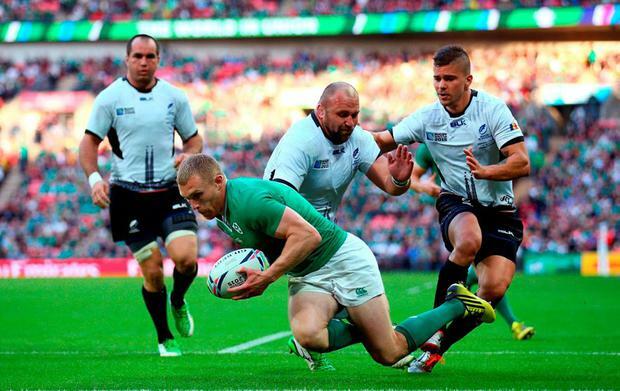 George Hook believes there was no need to re-introduce Earls after he was taken off after sustaining a knock to the head, and he criticised Schmidt's decision. "What we saw against Wales in the Aviva was Keith Earls gets being taken off the field on a stretcher with a head injury - he went through the protocols and was cleared", he said. "Against Romania he got a knock on the head. I'm not suggesting that he was concussed but I question why we had to get him back on the pitch. The game was won". As physicality becomes a more prominent facet of the modern game, brain injury and concussion begin to get talked about more and more. This is not exclusive to Rugby Union, but the issue has been debated extensively because of the nature of the sport. While there are protocols in place, Hook looks upon the decision to reintroduce Earls as an indicator that rugby is still not committed to the idea that player welfare is tantamount. "It demonstrates a belief that we are still not wholly committed to the idea that player safety in terms of brain injury is all important".